Enjoy some of the many attractions of Acapulco. Acapulco Convention Center, Caleta, Cathedral on the Plaza, Chapel of Peace, Cici Waterpark, Fort San Diego, Guerrero Cultural Center, Jungle Tour, Magico Mundo Marino, Mercado Municipal, Nature Tour of Tres Palos Lagoon, Palaco, Papayago Park, Pie de la Questa, Quebrada, Rocketa Island, Roller Papayago, Sky Flight, Zocalo. The Acapulco Convention Center is home to the Mexican Fiesta Folklore Show; commemorating the Mexico of the past. The entertainment includes regional dancers, lively music and pole climbers. The Convention Center is also the site of the Acapulco Symphony Orchestra and the famous Acapulco Music Festival. You can also enjoy the huge garden areas, as you stroll through a large variety of tropical plants and palms. Caleta is known as the oldest beach in Acapulco; a beautifully clear beach with restaurants, The Magico Mundo Marino (aquarium), boats to Roqueta and glass bottom boats that carry visitors around the bay. The design of this church is a product of Spanish, Moorish and native influences. Its distinguishable blue dome dominating the downtown plaza. Inside is an extensive collection of religious artefacts. One of the most recognised sights in Acapulco, completed in 1970, is The Cross up on the mountain; at La Paz Chapel. As well as taking a picture of the cross be sure to turn your camera around for magnificent view of Acapulco. From here you can see all of Acapulco bay and La Roqueta island. Located in the centre of the Acapulco strip, children and adults will enjoy a day at this water-based amusement park. Cici (Centro Internacional de Convivencia Infantil) has everything to amuse the children; from a big wave pool, some smaller pools, a giant water slide and seal - dolphin water shows. It also features a pool that offers a swim with dolphins. Visitors can also enjoy the beauty of the gentle waterfalls and fountains that surround the park. This fort turned museum features many antique relics such as beads, shells, baskets, ceramics, embroidered silk tapestries, Kimonos and porcelain vases. It also offers a glorious view of the bay. The fort was originally built in 1615 and then rebuilt in 1776, following a massive earthquake. It is built in a classic five-point design and surrounded by a moat. Constructed by the Spaniards to protect the port of Acapulco and its lucrative Manila trade link from pirates, Fort San Diego now serves as a fascinating history and anthropology museum. The Guerrero Cultural Center features a unique gallery and a small archaeological museum. While visiting Acapulco take a tour of Coyuca Lagoon; where Rambo II was filmed. Tours leave daily from Hotel Continental Plaza at 9:30 and 11:00. The Magico Mundo Marino, with both indoor and outdoor marine exhibits, is a fun place for all the family. Located in front of the Caleta beach area, it has a swimming pool, two water slides, an aquarium, restaurant, snack bar and a dolphin show. One of the largest markets in Acapulco, the Mercado Municipal is especially good for early morning shopping. The market is open daily but closes early in the afternoon. At the Parque Ecological de Viveristas, visitors can embark on an exciting adventure in a natural setting; to view some of the most beautiful sights that Acapulco has to offer. A unique feature of this tour is sightseeing while driving your own wave runner. Palaco, a large restaurant on Roqueta Island, combines Latin rhythms and exquisite cuisine with daily dancing and floorshow. Papayago Park is a large park featuring a roller rink, acres of trees, plush grass and an amusement park. Considered one of the best parks in Mexico for family fun, the amusement park has a number of rides to excite the thrill seekers, including many carnival rides. The park also features a beautiful aviary. Pie de la Questa is the famous sunset beach in Acapulco. Not only can you get a sensational view of the setting sun at Pie de la Questa, but also a great meal at any one of the beachfront restaurants nearby. 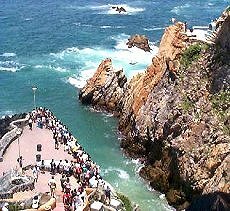 Quebrada is where you can view the legendary cliff-divers of Acapulco. For generations, brave young men have performed majestic dives into the Pacific Ocean. The Acapulco cliff-diving is one of the activities not to be missed. Visitors can also watch the sunset at the Symphony of the Sea; a grandstand built into the side of the mountain. Located directly in front of Acapulco Bay, Isla la Roqueta (Rocketa Island) is a 10-minute boat ride from Caleta Beach. The area is known as one of the best places to hike and snorkel in Acapulco. On the island there is an excellent beach and unique zoo; with lions, alligators, leopards, giraffes, zebras, an aviary exhibit and a serpentarium. If you're looking for something for the whole family, lace up your skates and head over to Roller Papayago; an outside roller skating rink, in front of Papayago Park. Enjoy a thrilling ride on this high-powered hang glider. The glider takes off from the beach and reaches an altitude of 450 feet, then cruises over the beaches of Acapulco. Zocalo is the former centre of the city; now called the Centro area. The large village square, located in front of the cathedral, is the main public plaza in Acapulco and a focus of activity; a pleasant place for families to stroll around on a sunny day. The cathedral, erected in 1930, has a dome in the shape of a Mosque and Byzantine towers. Enjoy the charm of the plaza, as well as the shops and small restaurants that surround it. You may even encounter a band concert at the music gazebo.